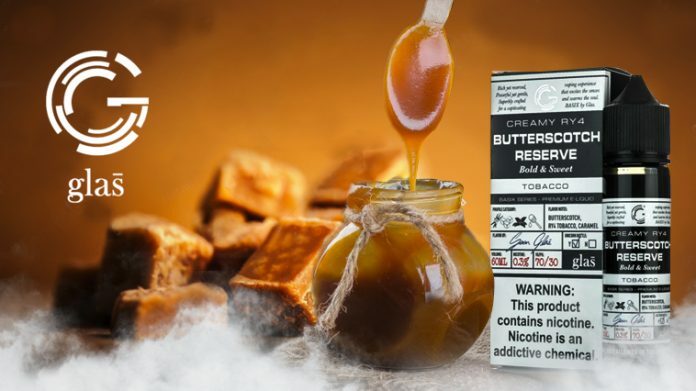 Perfect for Butterscotch fans and transitioning smokers! Bold, slightly sweet tobacco flavors shake hands with chewy caramel. Creamy RY4 Butterscotch Reserve from Glas is a must for transitioning smokers! I absolutely love the branding on the Basix line-up. Glas managed to keep everything clean and professional, while still making the packaging and bottles look presentable; this proves that cartoon character graphics, catchy titling, and absurd vape juice names are not necessary to increase the market value of a vape product. The gorilla bottles are a nice touch to the Basix line as well. Quick side note before we get into this flavor. Tobacco flavored vapes are definitely not my thing. I’ve had good experiences with RY4s in the past, but they’re not a flavor I would ever seek out. Caramel notes on the front end, mixed with a nice roasted nut component on the back. The butterscotch and tobacco do not make their presence known at this point. Single 3mm clapton on the deck of the Goon V1.5 RDA. Pulsed on the dual 18650 parallel box from Silver Steam Vapor. Single coil setups are great for flavor! Front – Extremely creamy mouthfeel (which is pretty typical for an RY4). The first flavor I pick up would have to be the caramel; it’s creamy, but hasn’t reached the complexity of a full on butterscotch at this point. There are some hints of a mildly sweet long leaf tobacco as well, and although it’s rather noticeable, it’s by no means “in you face”. Smooth flavors overall, and the sugar level in the liquid is very low. Middle – More of the same creamy flavors at this point. I get the direction Glas was going in to pull off the butterscotch flavor, but it’s working more as a chewy caramel with heavy cream on top. There’s a full-bodied tobacco flavor here; it’s still mildly sweet, and extremely approachable. End – The light caramel flavors fully subside at the end of this vape, leaving a creamy white sugared tobacco deal going on. There sweetness level remains very low, but is high enough to take care of some of the smokiness from the tobacco. Aftertaste – To my surprise, this liquid finishes super clean. Normally flavors with caramel or butterscotch tend to produce a crystallized sugar note at some point on the backend, and tend to stick around longer than they should. Not with this creamy RY4 though! The Glas Basix line is all 70/30, so you’re probably not going to enter a cloud competition with it any time soon. With that being said, this flavor production out of this single coil build easily made up for the lack of vapor! I’ve never been a big fan of tobacco flavored e-liquids. They do play an important role for transitioning smoker though. Glas does a perfect job at making their Creamy RY4 with Butterscotch super approachable; this flavor may work for anyone looking for a good rich caramel vape juice or a low sugar RY4. I would definitely recommend this one to a friend.